Remind me that I don't like photographing swatches with the Funky Fingers bottles? Geez Lousie, my fingers would not cooperate with holding this bottle. Anyways, I do have a Funky Fingers polish to share with you today. I believe this one was from 2010. I'm not sure if this came in a particular collection or what, but I do remember I won it in a giveaway long, long, ago! Jester is a purple scattered holo. Collection: Unknown, but released in 2010. Color: You can't go wrong with a purple holo. I know today we have tons of purple holos, but this was a purple holo back when it was harder to get one. I'd say this is more of a true purple. I know lately we have a lot of red-toned purples, this does have a red undertone, but it's more of a purple than an orchid or fuchsia. I'm also a fan of the scattered holo. We don't get a lot of those anymore. Formula: The formula on this was pretty good. It was 2 smooth coats and I didn't really notice any quality issues from the formula for it being so old. Price: N/A. I don't think you can find this anymore unless you come across it in a blog sale. Overall: This is a great solid purple holo. 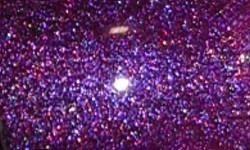 I love this shade of purple and the strongly scattered holo effect. I just hate Funky Fingers bottle shape!